The term church is any building that was built for the primary purpose of Christian worship, for any recognised denomination of Christianity. This article lists the twelve largest church buildings in the world as measured by various criteria. The Basilica of Our Lady of Guadalupe is a Roman Catholic church located on top of Tepeyac Hill in the northern part of Mexico City, Mexico. There are actually two basilicas on top of the hill with the same name with the newer one being much larger and having been built from 1974-1976. The older one is much prettier to look at but also much smaller in size. The new Basilica of Our Lady of Guadalupe can seat some 10,000 people. 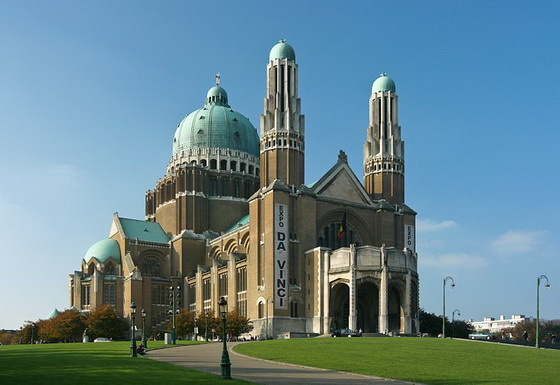 The National Basilica of the Sacred Heart is a Roman Catholic minor basilica and parish church in Brussels, Belgium. King Leopold II laid the first stone in 1905 during the celebrations of the 75th anniversary of the Belgian Independence. Halted by two World Wars, its construction was completed in 1969. 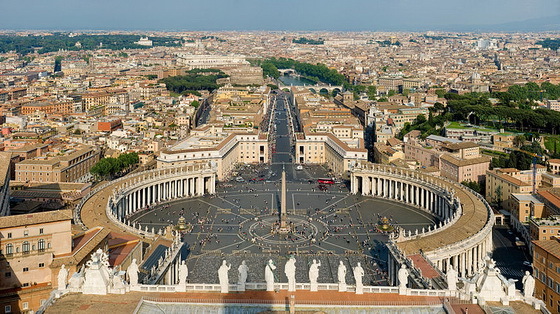 Covering an area 164.5 m (540 ft) long and 107.80 m (353.7 ft) wide, it is the sixth largest Roman Catholic Church in the world and the seventh among Christian churches. The Cathedral of Saint Sava is an Orthodox church located on the Vracar plateau in the capital city of Belgrade, Serbia. Construction of the church began in 1935 and it was mostly finished by 2003. The church honors Saint Sava who founded the Serbian Orthodox Church in 1219 and is today the patron saint of education and medicine in Serbia. 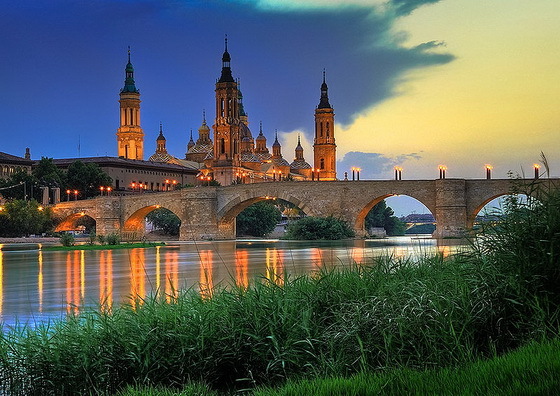 The Basilica of Our Lady of the Pillar is a Roman Catholic church located in the city of Zaragoza, Spain. It was built in the Baroque style of architecture from 1681-1872. The Basilica of Our Lady of the Pillar was built to honor the Virgin Mary who appeared before the Apostle James as he prayed by the banks of the Ebro River in Spain and she gave him a pillar of jasper and asked him to build a church for her in 40 AD. James built a small chapel for Mary near the spot which was destroyed after James was executed in 44 AD but the pillar was saved and preserved and placed in subsequent churches built on the spot including the present day basilica. The Church of the Most Holy Trinity in the Shrine of Our Lady of Fatima in Fatima, Portugal is the fourth largest Catholic Church and the sixth largest Christian church in the world. 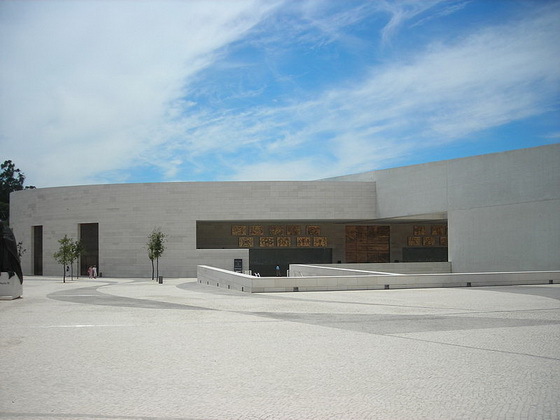 It was constructed between 2004 and 2007 and was consecrated on October 12, 2007, on the occasion of the 90th anniversary of the apparitions of Fatima. The church, dedicated to the Most Holy Trinity was entirely paid with gifts from the pilgrims. It measures 95 m (310 ft) long and 115 m (380 ft) wide, holding up to 9000 people. 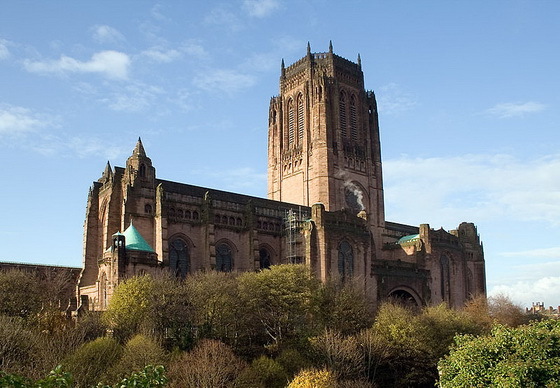 Liverpool Cathedral is a Church of England cathedral located right off Hope Street on St. James Mount in downtown Liverpool, England. It was built beginning in 1904 in Gothic Revival style using designs by architect Giles Gilbert Scott and considered finished in 1978. The massive cathedral tower is 331 feet high. Milan Cathedral is a Roman Catholic church located in the northern Italian city of Milan. This massive Gothic cathedral was built from 1386-1558. On top of the tallest spire is a baroque gilded bronze statue entitled "Madoninna". Tourists are allowed to climb up to the roof where they can view many sculptures. The Cathedral Church of Saint John the Divine in the City and Diocese of New York is claimed to be the largest Cathedral and Anglican Church and fourth largest Christian church in the world. Its interior measures 183.2 m (601 ft) long and 70.7 m (232 ft) wide. It was originally designed as Byzantine-Romanesque but was changed to Gothic. A huge fire damaged the church in 2001; construction and restoration still continues today thus earning its nickname: St. John the Unfinished. The Cathedral of Seville is a Catholic Church located in southern Spain in the city of Seville. It is also known as the Cathedral of Saint Mary of the See. The church was built in Gothic style from 1402-1511 and twice since then the dome has been replaced once due to an earthquake. Inside the massive Cathedral of Seville are 80 chapels and as many as 500 masses have been said on a daily basis. Christopher Columbus is buried on the church grounds. 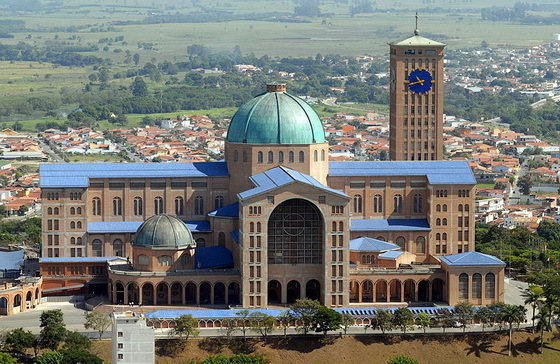 The new Basilica of the National Shrine of Our Lady of Aparecida was built in 1955 and designed in the form of a Greek cross. It measures 173 m (567 ft) long and 168 m (551 ft) wide, sitting up to 45,000 people. Pope John Pau II named it the most important National Marian Shrine in Brazil. It was officially declared as “the largest Marian Temple in the World” in 1984. Ironically the largest church in the world is located in the smallest country in the world as St. Peter's Basilica is in Vatican City which is considered its own country. St. Peter's Basilica is a magnificent structure built from 1506-1626 by a number of different architects including Michelangelo who designed the dome. St. Peter's is a Roman Catholic church and can hold some 60,000 people. It is certainly one of the most famous buildings in the world and one of the most visited by tourists and worshipers. I can't be the only one wondering about the 'Expo Da Vinci' banner on the Belgium church.